Add some sparkle to your Christmas table this year and learn how to make your very own copper candelabra. In this workshop, you will learn how to cut copper pipes and assemble them to create stylish home decor for your house. Each participant will then get to take home a copper candelabra to either keep or give as a thoughtful Christmas gift. We're returning to the beautiful Tram & Social for the second year after the huge success of last years Christmas Market with over 3,000 people through the door! Tram and Social (https://tootingtramandsocial.co.uk/) is a 2 minute walk from Tooting Broadway Underground station. Over 30 curated talented local designer-makers will be selling their handmade, locally produced products that will be perfect for gift-giving. Come along to enjoy a day of mulled wine and Christmas music! Like every year, I'll be selling at the Crafty Fox market at CLF cafe in Pekham, on Sunday 10th of December from 11Am till 5PM. CLF Art Cafe, The Bussey Building, 133 Rye Lane, Peckham, SE15 4ST. Train: Peckham Rye. I'll be joining in the fun at the Bust Craftacular Xmas market! 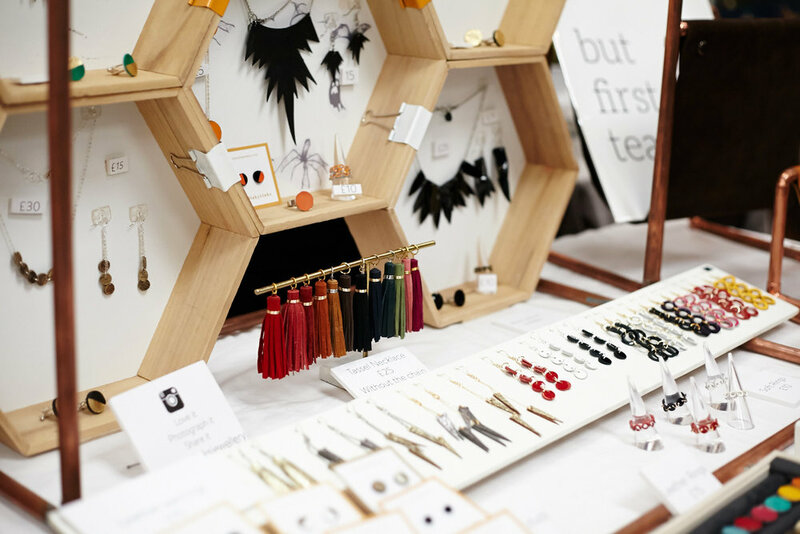 London's original alternative craft market returns for another sparkling, radical, fun-fuelled crafting extravaganza! BUST Christmas Craftacular will be just as packed with handmade craft, design, DJS and workshops to participate in as ever. With over 70 designer-maker-crafter-shakers showcasing their talents. The perfect place to meet the London creative DIY community, support independent makers and do your festive shopping. This year, the London Local Team is hosting their Etsy Made Local Christmas market in the heart of South London in the beautiful Tram & Social (https://tootingtramandsocial.co.uk/), a 2 minute walk from Tooting Broadway Underground station on Saturday 2nd of December (11am till 5pm). With over 50 independant sellers, we'll have some of the best craftmanship London has to offer so you can find local, unique and handmade items for your Christmas gifts. So come along to enjoy a day of mulled wine and Christmas music! Come and join me in Stoke Newington for a fun day of shopping local handmade gorgeous Xmas gift!! I'll be taking part in Crafty Fox market at the Mercato Metropolitano food market in Elephant and Castle on Saturday 18th of November from 11am. Where: Mercato Metropolitano, 42 Newington Causeway London SE1 6DR. Italian food market and community project, Mercato Metropolitano is a playground for food lovers and artisan food producers to meet, talk, relax, shop, and eat. As well as a selection of 25 of the best designer makers to satisfy all your shopping desires, you can savour a range of delicacies and enjoying tunes from the Crafty Fox DJs. Try out a new and unusual skill at this friendly and fun beginner’s metalworking event. Spend an afternoon making an elegant, on-trend copper candelabra with homewares expert Melodie Telliez. With exposed pipework and metal finishes popping up all over Pinterest, this workshop is a great way to try out the industrial trend. Learn basic metalwork techniques, including how to cut copper pipes, attach them together and finish them to create your own candelabra design. You'll be surprised what you can do with the right tools and don't worry, there are no hacksaws, just great fun designing and experimenting with shapes - anyone can do it! During the session, you'll learn from Etsy based jewellery and homewares designer Melodie Telliez. She will teach you the skills you need to know and advise you on your design. Whether you follow her examples or create your own ideas, you'll leave with a host of new metalworking skills that won't require investing in a metal shop of your own. All materials will be provided. Join fantastic designer and Etsy team leader Melodie Telliez for a creative afternoon making leather jewellery to reflect your own style. Melodie specialises in working with leather off cuts, and will show you her top tips for creating unique and contemporary jewellery with leather. You can use her templates or create your own designs, but you'll leave with a wearable necklace and pair of earrings. It's up to you if you want to be matchy-matchy or make three totally different pieces. The earring hoops are silver for sensitive ears, and we'll also have clip-on earrings and brooch options for those who don't do big earrings. Don't worry if you're new to jewellery design, at this workshop we'll show you how to work with leather, including cutting, painting and punching and how to combine that with a dash of inspiration and jewellery making skills. All materials supplied. We will supply pleather as a veggie and vegan option. We are proud to announce that we will be taking part in the Etsy Pride Pop-Up market happening at the Tate Britain on 24th of June from 2-10 PM. Coinciding with their new exhibition Queer British Art 1861–1967 – the first ever exhibition dedicated to queer British art - Tate Britain will be hosting a free festival celebrating the LGBTQ community through music, performance, talks, tours and film. Including activities for families, stalls and food, inside and outside on the gallery lawn the festival brings together key contemporary voices and perspectives from across the LGBTQ community in what’s set to be the unmissable event of the summer. This one day event will take place on the 24th June 2017 launching the two-week 2017 Pride in London Festival. As part of this festival Etsy has been invited to hold a market on the front lawns of Tate Britain on 24th June from 2am-10pm featuring UK based designer-makers. We will be selling our range of gorgeous jewellery and you will even have a chance to create your own bag charm! The BUST Craftacular is back at York Hall with a summertime shindig bursting with handmade goodness! Join us at York Hall for designer-makers, DIY workshops, DJs and drinks. London’s original cool craft fair is back with a summertime shindig bursting with handmade goodness – featuring over 70 designer-makers, a host of DIY workshops, DJs and the DRINK, SHOP & DO pop-up café. Entrance is £3 on the door with goodie bags for the first 100 shoppers! Running in London since 2008, the BUST Craftacular is a fun crafty event conceived by the fierce, feminist folk at New York pop-culture magazine BUST. The summer showcase for indie designers features household names such as paper-cut artist Rob Ryan as well as exciting up-and-coming businesses. ‘London Local’, a dynamic collective of MORE THAN 900 London-based Etsy sellers who collaborate to promote handmade artisanal talent in London, will be hosting a curated handmade market at ‘Mick’s Garage’ by CRATE Brewery, Hackney Wick and I'll be part of it. Come and browse my new line of jewellery and copper stands! Yes, we are doing again! Etsy Made Local is back with over 80 Etsy sellers, all together in the great hall of the Hornsey Town Hall in the very exclusive Crouch End area of North London!. We are there for 2 days, bringing you a wide selection of beautiful handmade and affordable Christmas gifts! As one of the captains of the London Local team, I often help organised great event like the LoLo Autumn market! Such a fun event, full of talented designer-makers!! SlinkyLinks will be taking part in the Craft Fair at the second Cancer Survivors' Day event, 'A Celebration of Hope', at Guy’s Hospital, Great Maze Pond, London SE1 9RT on Sunday 5 June 2016 from 2.00 pm to 6.30pm. This is a special event for patients, their families, care givers, staff and the community to celebrate cancer survivorship. The day includes a fashion show, live music, exhibits, tours inside the new Cancer Centre, summer picnic, seminars, reflection and contemplation. The event is free but you must register your attendance to ensure access. For any questions, or if you need help with registration, please contact the event organiser, Martina Bohn, via email at martina.bohn@gstt.nhs.uk or via phone on 07905375725. We'll be in touch soon with our latest products and offers.